During our lives, we mark time by the change of seasons, and with each new season comes a bevy of outdoor experiences that spark our senses. In the spring, we can smell flowers or rain in the atmosphere. Summer is filled with sunlight that warms our skin and causes our eyes to squint. In the fall, we take pleasure in the cooler air that provides relief from summer’s heat. According to one study, spending time outdoors makes us feel more alive. 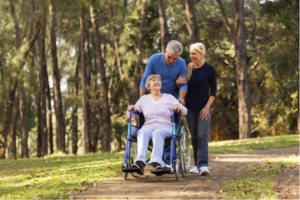 For the elderly who have limited access to transportation or diminished mobility, being exposed to the natural environment is even more crucial. Nature Deficit Disorder is a label that originally applied to children who stay indoors too much, watching TV and playing video games instead of playing outside. The term also can apply to older adults who are confined to nursing homes or their own homes because they are unable to get around independently, resulting in a negative effect on senior health. In his book entitled The Nature Principle, author Richard Louv puts forth the concept that by connecting with the recuperative powers of nature, we can, among other things, boost mental sharpness, promote health and wellness, and reinforce human bonds. The natural world is such a vital part of our lives. It’s connected to the human experience in a variety of ways – through water, plants, weather, animals, and variations in regional surroundings. In addition to having the potential for enjoyment, nature also provides a variety of topics to talk about – just watch your local news tonight and the weather report is certain to be at the top of the line-up. There are many ways to help older adults enjoy the outdoors. Caretakers or family members can bring older adults outside on porches or decks to take pleasure in a summer breeze, find parks with paved paths that are safe for walkers and wheelchairs, visit arboretums and conservatories in the colder months, and engage in activities like tabletop gardening and bird watching. Just make sure to help the older adult you care for wear appropriate clothing for the season and sun protection while enjoying the outdoors. At Hired Hands Homecare – California, we realize how significant the natural world is to those for whom we provide home care and senior support. For more information about how our California in-home care services can help improve senior health for your loved one, please contact us today.